This morning I received my copy of "Web Form Design" from Rosenfeld Media less than 2 weeks after I ordered it, which isn't bad for a transatlantic delivery. I have been checking the status of my order for the past week and I was getting rather annoyed by not being able to find a direct link to the "My Orders" page on the Rosenfeld Media site. 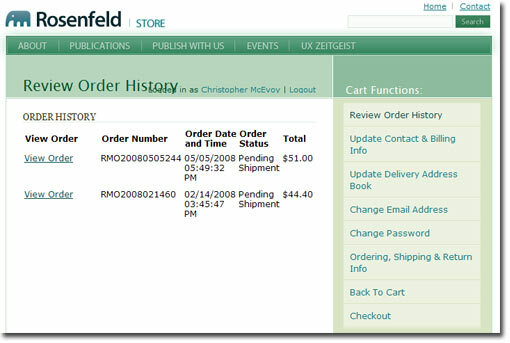 I found that I had to go to the Rosenfeld Media site and pretend to order a book so that I could get to the link to the "My Orders" page. Whilt I was at work last week I also used the same convoluted navigation path to get to my digital download link for the book. If wonder if Rosenfeld Media are seeing a lot of abandoned shopping carts because of people using this method of getting to their Rosenfeld orders page? I had a couple of hours free today, so I decided to have a go at designing my ideal version of a Sitemap for Rosenfeld Media. The natural navigation of the Rosenfeld Media sits is defined by the top navigation bar which lists the main sections as "ABOUT", "PUBLICATIONS", "PUBLISH WITH US", "EVENTS" and "UX ZEITGEITS". I renamed and re-ordered these sections to be "Books", "About", "Publish With Us", "Events" and "UX Zeitgeist". Using mixed-case titles makes it easier to read the list of items and I prefer "Books" to "Publications" as it is a better description of what Rosenfeld Media actuallt sells. These top-level options still didn't solve my problem of getting to "My Orders", so I introduced a new top-level item of "Store" which left my top-level navigation items looking like this: "Books", "Store", "About", "Publish With Us", "Events" and "UX Zeitgeist". 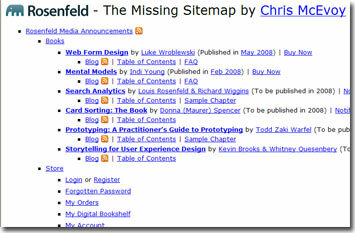 I then turned my attention to the detail of the "Books" section of my sitemap. I didn't like the fact that "Web Form Design" appeared after "Mental Models" as I feel that the most recent book should appear at the top of the list. Once the books for sale have been listsed it does make sense to list the "books in progress" in the order that they are due to be published, This means that once "Search Analytics" is published it will move from number 3 in the list to number 1. The "Published" and "Soon to be published" books are also differentiated by their "action phrase". The published books have a "Buy Now" action phrase, whilst the other books have a "Notify Me" action phrase. I spent about an hour trying out different layouts for the book item link lists before settling on the version you can see online. One of the difficult decisions was where to put the links to the Customer Forums to the two published books. It seemed to make send to put the individual links next to their respective book items, but after trying out a number of prototypes it made more sense to put these links in the "Store" section as they would not become really useful until you had actually ordered a book. I then went through the sitemap and added links to RSS feeds where appropriate. Designing and producing this sitempa actually took about four hours and I spent as much time deciding what to leave out of the sitemap as to what to put into it. Even if you don't think your site needs a sitemap you should always produce one just to make sure that your information architecture model makes sense. 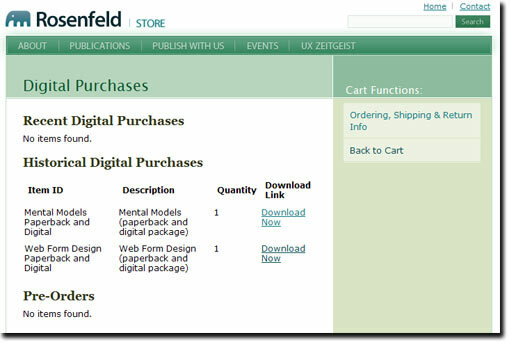 This exercise suggests that Rosenfeld Media should add a "Store" item to the top level of their navigation and it would be interesting to know why this hasn't made it into the design of the site. If you like this you might also be interested in Simply Google.